There has been a wealth of articles and research recently extolling the virtues of playing outside and laying all the problems of the current generation on the fact that they don't. I totally appreciate the reasons why parent's stopped letting their kids play outside. When I was a kid I was 'the one with weird parents who won't let her out' (in the words of my classmates at age 10 or so), but now it has become the norm. Whether it's fears over stranger danger or the increased business and recklessness on our roads, I think that articles which try to make parent's feel stupid for not understanding the real levels of risk are unkind. The risk may be smaller of a child being hit by a car as a pedestrian than the risk of them being involved in an accident while riding in a car, but it is counterintuitive to us that they are not safer while cocooned in a car under our watchful eye, so we are unable to process an appropriate perception of the real risk. To poo poo that is to mock our fundamental nature. The only solution I can suggest is to get outside WITH your children as often as possible from an early age, so that when you decide they are old enough to go out by themselves they are in possession of enough experience of crossing roads and climbing trees with your guidance that they reduce their chances of doing something really silly when they are in charge of their own actions. This is what my folks did, and we spent most of our childhood out on our bikes exploring the redways and play parks of Milton Keynes. I may have been dissatisfied at the time with the lack of 'real' freedom and the way it isolated me from my peers, but each generation does what it feels is best to care for their own most precious children. I don't know what ages my boys will be when they're allowed out alone, I guess it will depend on circumstances and where we're living at the time. In the meantime, while they're so little I am bucking the trend of my neighbourhood of allowing them to join the small packs of very sweet but quite feral children that roam the estate. I may have been impressed by the vocabulary of the youngster who told us to 'stay away from that girl she's addicted to fornication' but I'd rather avoid that future for my kids if I can. The risk then of abduction, squashing, falling from trees or learning to swear like a well travelled sailor are real, but what of the risks of staying indoors? These have been well documented, including potential links to increased childhood obesity and associated health problems, hyperactivity, poor attention spans, poor concentration, weaker muscles and bones, reduced digestive health from inactivity, increased allergies from lack of exposure to dirt, even some suggestions of an increase in poor eyesight. These are correlative conditions rather than a definite cause and effect relationship, but the evidence does seem to be trending towards the obvious 'spend lots of time outside in a natural or semi-natural environment, good, spend lots of time indoors glued to a screen, bad'. What did we gain from our trip to the play park today? I put my back out again last week, so our trips to the local play park have involved a much less hands-on approach from me. Instead of climbing up the steep hill of the slide hanging on to Toby while Ollie whizzed round and round overtaking us repeatedly, I put Ollie in charge. 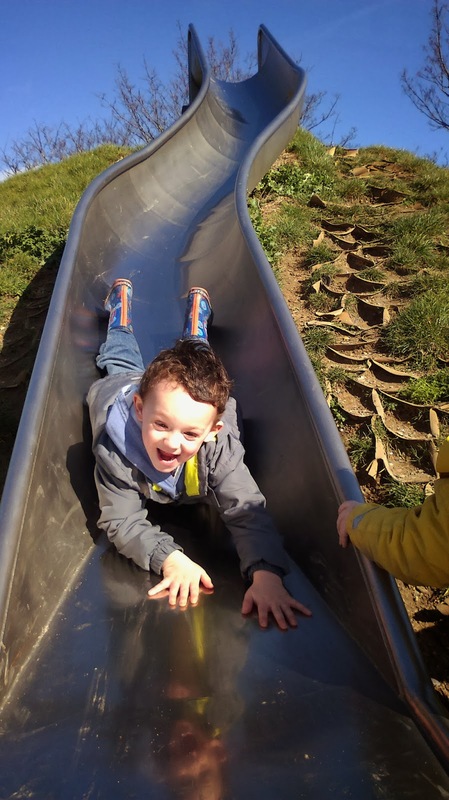 He was only allowed to play on the big hill slide if he helped Toby up each time. My heart was in my mouth the first few times, with images of Toby getting a smashed head on the boulders or breaking his neck rolling off the top awkwardly. Ollie took his responsibility well (with a fair bit of encouragement to start with to keep him behind Toby up the slope and not just charging past him). He quickly found they could slide down faster on their bellies, so started loading Toby on to the slide that way round. When Ollie discovered that sliding down head first on his back made him go too fast so he flew off the end and hurt himself a little, he then took care to flip Toby over back onto his tummy when he tried to copy his big brother in that manoeuvre on the next time round. 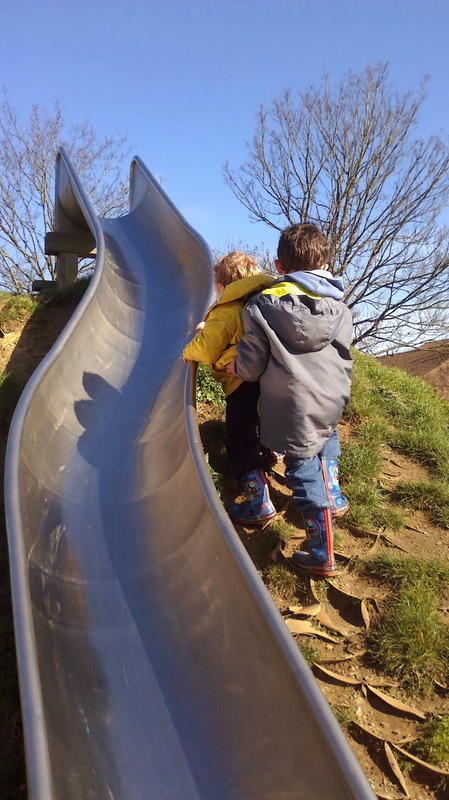 They discovered that climbing up the side was quicker than going round the proper route at the back, and that trying to walk up the slide itself was harder. By helping his little brother, Ollie found that the reward was not just a happy mum, but also more fun than barging past and playing on his own. Toby gained a lot more turns than if I had been helping him and it was Ollie he turned to each time his boot came off or he got stuck. Opportunities to build up reliance on each other and to build trust and compassion will hopefully help them to stay great friends into adulthood. The boys gained physical exercise, development of gross motor skills, problem solving skills, teamwork skills. It is thought that the mental stimulation and low level of stress hormones produced during slightly risky play helps to acclimate the body to stressful situations resulting in children growing into adults who react less adversely to stressful situation. In addition, this kind of play makes children feel good and increases their sense of self esteem as they conquer challenges. Yes there are risks from playing outdoors, but there's so much to gain, even if it's just an hour out in the air every day. 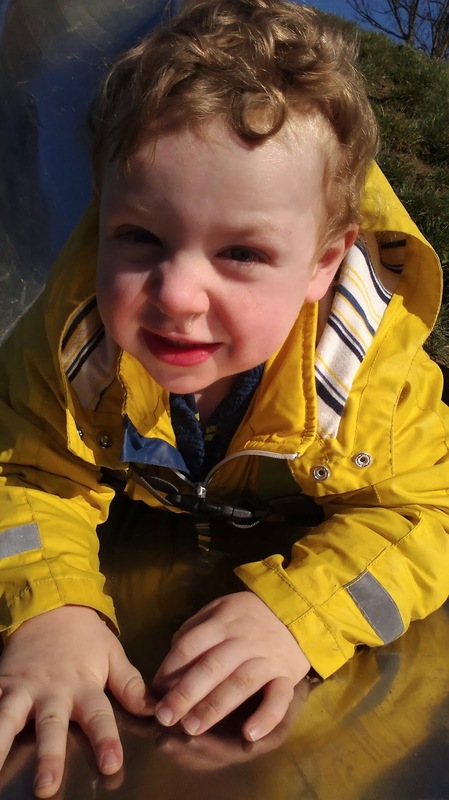 Sometimes I get disheartened by the rubbish and the dog muck and the vandalism and I resort to driving them to places that I deem to be less unsanitary such as the indoor play gym, but when you get smiles and sunshine like today it fortifies you to keep going and keep getting outside.